Murchie’s has provided me with Cozy Caramel Rooibos for the purposes of providing an honest review. 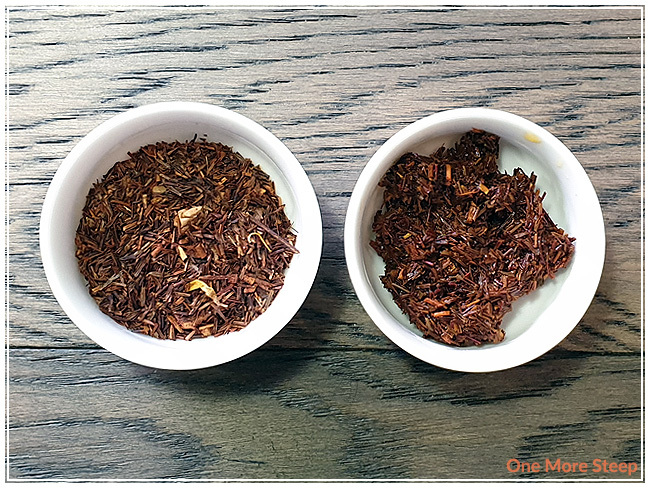 For those who’ve been following One More Steep for a while, you’ll know that I often don’t really rooibos blends – but lately I have been (really) trying to have a more open mind about it because a lot of people really like rooibos. So when Murchie’s sent me Cozy Caramel Rooibos, my initial thought was “Oh no!” because of my past experiences with rooibos blends. This rooibos blend came in a sealed, resealable plastic pouch. The blend itself smells like caramel. All I smell is caramel and it makes me think of caramel apples, caramel chocolate, caramel kettle corn… What can I say? I like my sweets! The name for this blend is definitely on point and very accurate for the aroma. And I can’t even smell the rooibos base, which is a tiny miracle in itself. 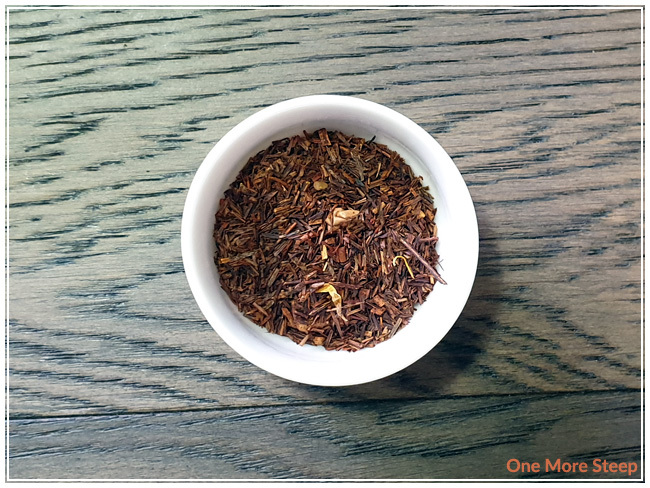 Cozy Caramel Rooibos consists of: rooibos, dried apple, calendula petals, natural and artificial flavouring. Murchie’s recommends steeping Cozy Caramel Rooibos in 190-212°F (88-100°C) water for 4 to 5 minutes. I did an initial steep in 200°F (93°C) water for 4 minutes. Cozy Caramel Rooibos steeps to a beautiful golden orange. There’s a lovely sweet, caramel aroma that wafts up from the tea. When I taste it, I’m confronted by a few different flavours. 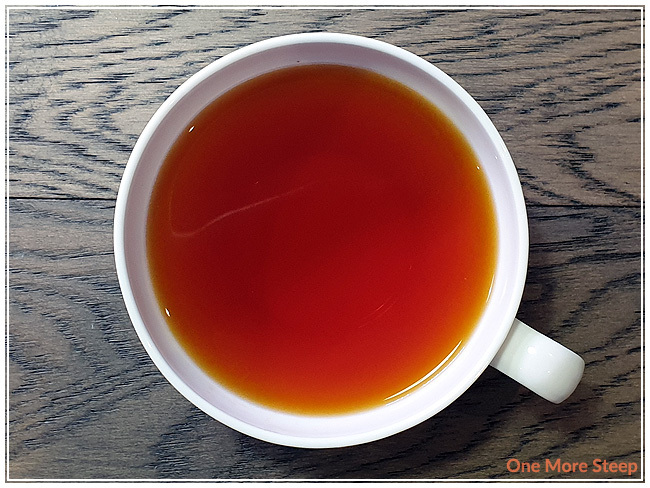 First is the sweetness that I believe comes from the apples, then there’s a nutty flavour, some caramel notes and, of course, the rooibos base that adds just a touch of medicinal quality to the flavour. However, most of the flavour that I get out of this blend is the caramel, sweetness, nutty flavours so I’m not overly bothered by the rooibos base itself. I resteeped Cozy Caramel Rooibos once, at 4½ minutes. I found that the rooibos base was very much present, while the rest of the flavours weren’t as prominent as I would have liked. If you enjoy the flavour of rooibos, I would recommend doing another steep. If you’re not a huge fan of rooibos, I would recommend just the initial steep. I liked Murchie’s Cozy Caramel Rooibos. 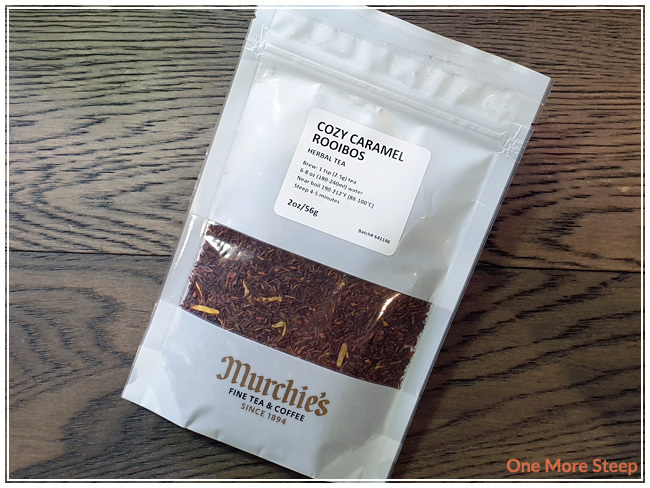 I think that the team at Murchie’s did an amazing job of making me think of caramel when it comes to this blend – from the aroma of the dry leaf and steeped tea, to the flavour of the rooibos blend itself. It makes me think of carnivals and the food that goes along with it, which is a fantastic thing to think about! 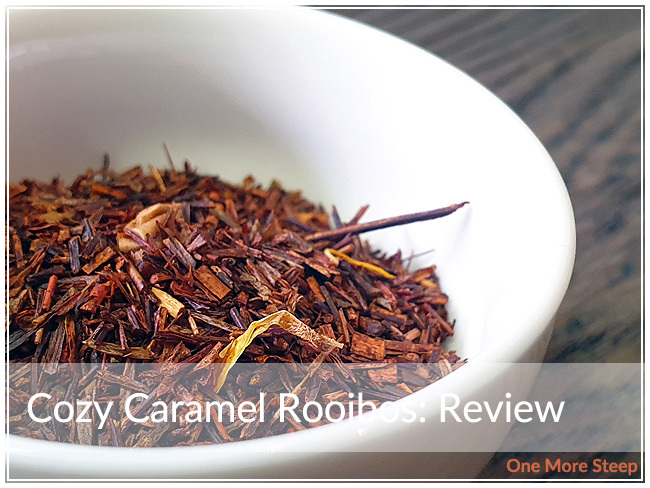 I’m still not sold on the flavour of rooibos itself, but I greatly enjoyed the initial steep of Cozy Caramel Rooibos and think it makes for a great dessert blend to have when you’re in the mood for something sweet.